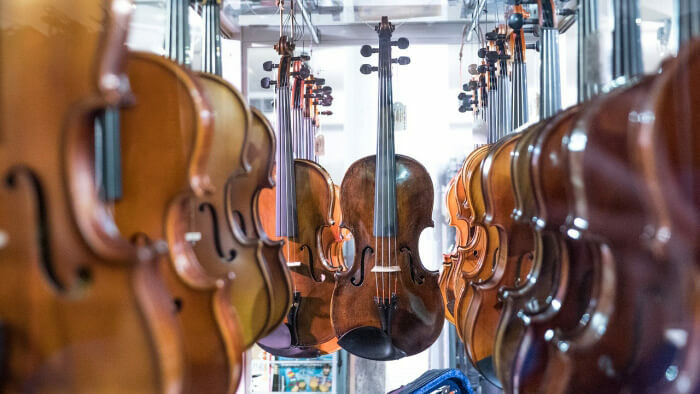 For the inexperienced buyer, it can be quite daunting to begin a search for a fine stringed instrument such as a violin, viola, cello, or bass. A good instrument can make all the difference for advancing students at auditions and competitions. Parents, students, and adult amateurs can find helpful tips in this guide to help start the search to find the best viola brands and read viola reviews. There are many considerations to think about before purchasing a viola. While it may seem very convenient and affordable to buy online, this is only recommended with the help of an expert teacher. There are many instruments of lesser quality that will require continuous repairs or upgrades. It is better money spent to pay a little more for higher quality that will produce a more beautiful sound. Some instruments sold online must still be adjusted by an experienced luthier in a shop, so the “deal” that you thought you were getting is cancelled out by additional setup fees. What feels and sounds good to one person will not necessarily be the same opinion as another player. Choosing the best viola is a very personal decision, especially for advanced students and professionals who play their instruments for many hours each day. Unlike woodwind and brass instruments where there are particular trusted brand names to buy, quality string instruments and bows are hand-crafted by many excellent makers around the world. There are so many makers, the best way to narrow down the choice is to go to a local specialist violin shop to find the best viola brands. Try instruments and bows, as well as ask your teacher and trusted professionals for their recommendations. Depending on where you live in the U.S., there may be one main violin shop or luthier in your town, or many to choose from in major cities. Many luthiers will ship instruments to prospective buyers for a trial period. First start with your local shop to find the best viola brands, and try many instruments in various price ranges as well as different bows. Begin with the instrument, then experiment with a bow that matches the instrument well. This is a very specialized process, and the more advanced player can begin to hear the nuance in the sound. A less experienced player may need guidance from the luthier, teacher, and other experts to make a purchase decision in order to find the best viola. Beginner viola outfits typically include the instrument, case, and bow, fitted with cheaper strings in one package price. The more advanced the instrument, the more customized everything becomes. Advancing students and professionals buy an instrument, bow, and case separately based on budget and personal preference. Often professionals have a very high quality bow for most concerts and a budget one for outdoor performances or to have as a spare. The player’s level is the first consideration. No matter which level you are at, buy an instrument that you can grow into. If the instrument is slightly above your current level, you will be able to improve and grow into the instrument rather than be working too hard without a good projection, clear response, or result. Typically smallest size for a viola is about 12-13 inches in length, just under the size of a full-size violin. Once you are at this size consider buying. For younger students it may be more convenient to rent an instrument until you are at least 10 or 11 years old. The shop will deal with repairs and you can trade up a size when you are ready. Often you can rent an instrument and receive a credit towards the bigger size at the store when you are ready to move up. This provides store loyalty and the incentive to stay with their products. This is one very good reason go with your teacher’s recommendation of specialist shop from the beginning of your lessons. More money will buy higher quality. This is especially true with fine stringed instruments. However, you can find decent quality student instruments for less than $500, more so than in the past. Remember to include a bow and case in the budget with the viola, they are not always sold as a package price. An intermediate student should plan to spend closer to $1,000-1,500 and an advancing student should have a budget for a quality bow and instrument, along with a more protective case, a budget of at least $5,000 and up. What are your goals for playing? Are you an avid amateur, serious advancing student, or professional? Each of these categories would be a very different price point. A serious student should buy an instrument that can carry them through auditions to university and into a professional life. A young professional may want to upgrade from their student instrument in order to maximize their chances win auditions or for continuing their professional career. An amateur can buy an instrument in any price range, but it will be most enjoyable to buy something in the advanced category. Read more below about viola reviews and best beginner and intermediate violas to try. Remember that a high quality bow can make a huge difference to the sound quality and timbre of the instrument. Save a little on the instrument and invest more in the bow if you have a limited budget. If purchasing a package, upgrade the bow as it may be a low end bow that can be used as a spare. For young students, a restrung violin is usually acceptable up until you are able to play a 3/4 size violin. Then you can look for a better quality instrument and an actual viola. Violas differ from violins in that once you reach a full-size viola, there are several size (width/length/shape) options. 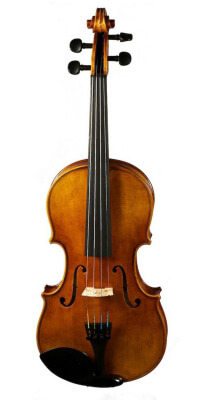 Violins have a standard 14.5” length and only vary in other size aspects such as the way the fingerboard is shaped or the bout or shoulder width. The smallest violas are made at about 11” but many choose to purchase their first viola when it is close to the full violin size (14.5”). More options are available for the 15” and up size. This is essentially a similar length to a violin, but will vary more considerably with the shoulder and bout width as well as the neck. Unlike violins, full size violas come in many varying lengths, shapes, and sizes. While some makers have copied the old masters of Stradivarius, Guarneri, and Amati with their patterns, other makers choose to alter and change the shape. Here is a very helpful sizing chart from Fiddleheads.ca, although remember to go by player’s arm length and not age, it can be widely variable as everyone’s body size is different. The arm length as well as hand and finger size plays an important role in finding the correct fit for the best viola. When in doubt, start smaller before moving up to a size that is too large and bulky. This is a very wide category, as most specialty string shops sell violins, violas, cellos, double basses, along with a large selection of bows. Then there are the cases, shoulder rests, strings, rosin, fine tuners, chinrests, and many other accessories required for instrument upkeep as well. Search within your local area first for a quality luthier and shop. Sometimes luthiers work on their own with a very small premises and only professional clientele. Others work within a shop with a larger variety of instruments and customer base. If you cannot find any within close proximity of your city, search within a few hours’ drive. Cities with over 500,000 should have at least one specialist shop within the city limits. Certain shops only carry a few good quality violas, while others have a wider selection, so it is best to take time for your search. Avoid an all-around instrument shop, as these types of stores have a very limited string selection and in general the salespeople are not as knowledgeable about string instruments. Violin shops employ luthiers who can repair, build, and examine string instruments. Many also play them to a high level, so they can demonstrate the sound of an instrument or bow for any customer. For students who are starting their musical journey, a violin shop will be your “go to” place for many years for instrument adjustments, accessories, advice, and upgrades to your current set up. Some families may decide to go online for an instrument search. While this is a good way to comparison shop, it is not recommended for an advancing or serious student, except if you plan to trial instruments and are then able to send them back. First, let’s explore several very good options for purchasing an outfit, which means you buy everything you need in one purchase price. Ask at your local violin shop about what discounts they may give for purchasing a case, instrument, bow, and accessories together. These shops are by no means the only quality shops, there are many more across the U.S. that offer excellent value for money. A note about the size ranges listed below: The most common sizing for violas is 12”, 13”, 14”, 15”, 15.5”, 16”, and 16.5”. There may be some variations in larger sizes and sometimes smaller violas available, but typically these are the sizes available from most shops. Many string players of all levels think of Shar Music for all their instrument needs. Based in Ann Arbor, Michigan, they are a family-owned business with many generations working in the company. Their products are high quality and good value. 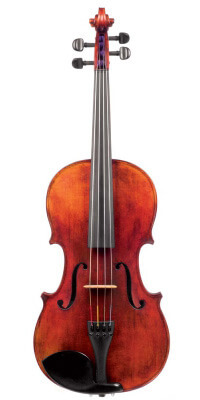 The Franz Hoffmann Concert Viola offers a rich, viola sound for the beginning player. Each outfit comes with a case, rosin, and brazilwood Schmidt bow. Size range is 12” to 16.5”. There is a video sample on their website to hear this instrument. Musicians in the Chicago area and the Midwest will know about the fine instruments at William Harris Lee. They now offer a student range for the lower price point. This viola is available from 10” up to 16.5” sizing and comes with a case and carbon fiber bow. There is not a video or detailed description of the instrument, so it would be best to visit the shop and try it first. The DZ Strad Violin Shop offers a wide range of instruments and outfits. In the beginner category, the LeSong Concerto Viola is good value for money. Every outfit comes with a case, brazilwood bow, and rosin. The size range available is 12” up to 16.5”. The instrument has a spruce top, maple sides and back, and ebony fingerboard. The price reflects the instrument purchase only. There are many options for upgrades, including better quality strings, a choice between two bows (composite or brazilwood), and several case options. This is an excellent service for the student who wants to customize their purchase experience. There is a video to watch with an example, although note it is the violin model and not the viola. The size range is from 12” to 16.5”. Potter’s Violins is based in Maryland and have an excellent rental solution for those who do not want to purchase an instrument yet. They offer quality rentals for students across the U.S. who can then have a credit to be used for a later purchase. These violas are more about exploring the variants in sound quality and pairing an instrument with a specialized bow. While a few outfits are listed, most of the time you would choose an instrument separately from the other elements of the outfit. As the case with any instrument but especially as you start to spend more money, try before you buy! This outfit is a great value for price for a good intermediate viola brand. 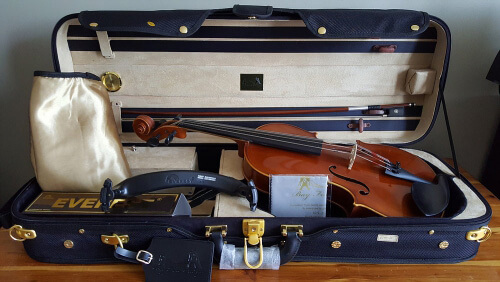 Unlike the beginner viola outfits, this one comes with a higher quality pernambuco bow, higher quality strings (Warchal or Corelli), shoulder rest, rosin, and better quality case, all in one price. The viola itself is available in the larger sizes, 15”-16.5”. The viola is a quality Chinese model, adjusted to excellent sound standards by the Bay Fine Strings luthiers before going out on the sales floor. This model of viola is well-known for its powerful tone and excellent range for the advancing player. 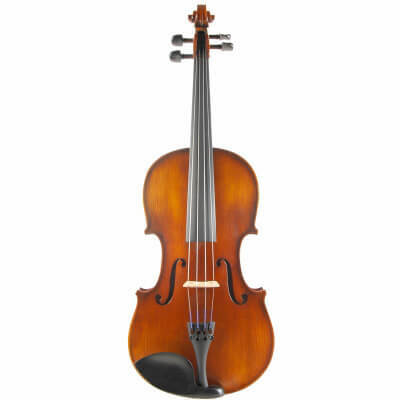 Johnson String Instrument company offers an outfit with the viola in a size range of 15”-16.5”. The viola is fitted with high-quality strings and comes with a Coda bow (composite), and quality Bobelock case. This outfit would be an excellent choice for an advancing player or keen amateur looking to upgrade who is ready for a full size viola. A modern day Chinese maker, Scott Cao has a wide range of instruments available, from factory-made to hand crafted. He has won many awards over the years for his mastery of luthiery. His violas range in price from $600 and up. Many shops around the world sell his instruments, so enquire at a shop or look on his website for a dealer near you. The lower priced instruments are available from 12” and up, the more specialist instruments are only available from 15” up to 16.5”. Samuel Shen violas range in price from about $600-$3,000. There are three models available, with a range of price and sound quality. Only larger sizes are available, from 15” to 16.5”. Go to the “dealer locator” on his website to find an instrument to try. This model viola is based on the wider body Maggini make, with a rich, dark tone. The sizing is from 14” up to 16 ⅞”. This make and model is made in limited quantities, which makes you feel as though you are buying a much more unique instrument. Jay Haide violas have an excellent reputation amongst both players and teachers as a best intermediate viola and best advanced viola brand. KC Strings, based in Kansas City, offers a wide range of Anton Krutz violas, for the beginner up to advanced. There are video demos of almost every one of the Krutz models, although it should be noted that the player is of a middle-level standard and the excerpt is short. Like Southwest Strings, the KC Strings website offers ways to customize your outfit to exacting specifications for bow and case choice. Sizing is from 15” up to 17”. Make sure to try this instrument before purchase. The budget for an advanced or professional viola should be at least $5,000 and higher. There are few makers who have a hand-crafted instrument for less than $10,000. In the scope of this article it is not possible to recommend only a few makers. Sean Peak is one to note because of its affordable price for the quality of the instrument. A great resource for all things strings, Violinist.com creator Laurie Niles edited videos and written a post about 33 modern viola makers at Metzler Violin Shop in California. Have a look at these videos with an excellent professional violist demonstrating each instrument with the same excerpts so you can hear the differences. Though little information can be found about Sean Peak as a viola maker, the instruments are some of the best quality for the price. Most shops sell these instruments at just under $5,000. The size range is 15” to 16.5”. These instruments have a full-bodied, rich sound, that rival some instruments more than twice the price. String shops all over the U.S. carry Sean Peak violas, they have been very popular purchases over the last twenty or so years for young professionals. 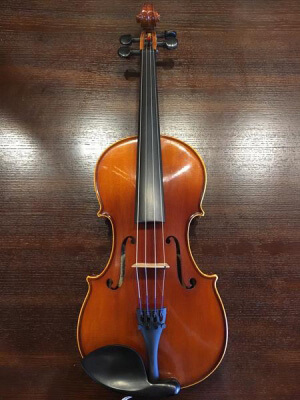 They have a consistent quality, but for a special and very unique viola there are many other makers to try, though usually with a higher budget required. There are an abundance of luthiers who make high-end, quality instruments for professional players. It would be a disservice to their craft to try and narrow down a list here. As recommended above, when spending more than a few thousand dollars on an instrument, try several shops and more than a few instruments. The search will also a very personal one. What one player will love in an instrument, another may not like at all. The size, shape of the neck, width of the shoulders, and type of bow are just a few of the variations. If in your search you fall in love with one particular instrument, take the time to think about it, do several weeks of a trial period, and then the money will be well spent on a measured decision. The American Federation of Violin and Bow Makers has a directory of reputable luthiers who live and work all over the U.S. There is a search bar by location which will be very helpful to find someone in your area. Work with your teacher and other string professionals for recommendations and reputable dealers. When trying an instrument, make sure to play and listen carefully to the sound quality of the notes on all strings, and in all positions. Some lesser quality instruments can have a “wolf” tone, meaning an overtone is produced that is not desirable, usually occurring on the G or C strings on the viola. Instruments that are higher quality and have been adjusted properly with the sound post and bass bar will have an even, clear sound on each string. Formerly, many players were told that only the old Italian masters would suffice for the best sound quality. This has been proven wrong by the craftsmanship and talent of modern-day stringed instrument makers. It is more about the player than the instrument at a higher level, too. A great violin will only sound great with the skill of the player. You can read here about the science behind a modern violin versus a Stradivarius. There are an abundance of choices for a quality viola purchase. Note that a completely new instrument will need “break-in” time. The sound quality is not developed until after it has been played regularly, and this depends entirely on the player. Playing more will help the instrument to open up and mature faster. Changes can be noted even 6 months after the instrument has been purchased. These shops are by no means the only shops to go to, they are selected because of their large selection of violas for serious and professional violists. A very important yet sometimes overlooked piece of equipment for a string player is a quality bow. The bow is the method by which all the sounds are produced on the instrument, apart from plucking! A bow can make a significant impact on the sound of an instrument. Modern day bows can be made of anything from synthetic carbon fiber, fiberglass, or the more traditional brazilwood or pernambuco. Traditionally the best quality bows are made of pernambuco wood. This is because of the wood’s density and balance compared to other materials. Brazilwood bows can also be of a very good quality, but some can feel a little more bulky or dense. Similarly to choosing a fine stringed instrument, the best way to know which bow to purchase is to try a few bows for a trial period. Depending on your playing level, you will also want a trusted teacher or professional to try the bow as well, if you are not able (yet) to play more advanced strokes. The teacher can demonstrate and show you if the bow is well-balanced and a good investment. Typing “cheap versus expensive bow” will bring up ridiculous comparisons between a $500 bow jumping a whole several price ranges to a $40,000 bow comparison. There are many $500 bows that could be a great investment for an advancing student. For an advanced or professional player, a budget of at least $2,000 and upwards of over $10,000 can be expected. This really depends on the type of performer you are and complementing your instrument. The bow can really make your sound vibrant and beautiful, and help you to play more difficult off the string passages effortlessly. For the serious and developing player, the best viola brands are not actually a brand, they are possibly a maker. That maker spends hours upon hours with minute details, carving, shaving, edging, and creating a beautiful unique instrument. Then the player selects their instrument and will spend hours upon hours practicing and perfecting the music they love. Choosing an instrument is a serious and very personal experience, especially for professional players. The purchase of a viola is an investment in your musical future. Whether you are a young student, intermediate player, or professional player, a good quality instrument and bow can make all the difference in your performing abilities.